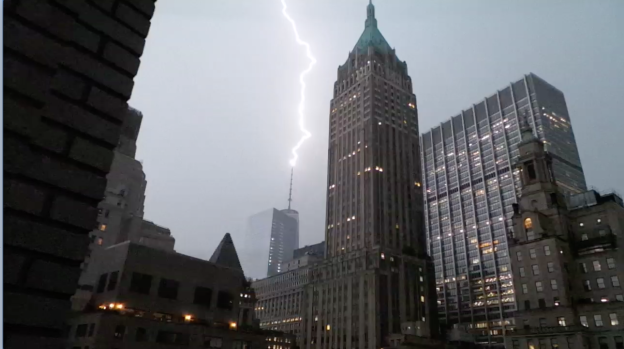 A round of thunderstorms roared through New York City and the tri-state Friday evening, causing heavy flooding, traffic jams and flight delays just as the unofficial start to summer got underway. At one point during the storm, lightning struck the spire of 1 World Trade Center. The spectacular image was captured by several NBC 4 New York viewers (see video above and photo gallery to left). Fierce storms rolled through the area starting around 7:30 p.m., with hail and flash flooding reported in some parts. Heavy flooding caused a miles-long traffic jam on the Long Island Expressway during the evening rush. Firefighters had to rescue drivers caught in rising floodwaters in Queens. Flights at Kennedy, LaGuardia and Newark airports were delayed an hour or more because of the weather.